There isn't one correct way to walk your dog — a lot of it depends on your situation and preferences. When I take my dog for a walk, should I have him heel the entire time? Or is it ok to let him walk in front of me on occasion? There’s no one right way to walk your dog — in fact, the only real “rule,” if you will, is that the leash should always have some slack. In other words, your dog shouldn’t be pulling you along, and you shouldn’t be pulling him. Where your dog should walk — at your side, in front of you, slightly behind, somewhere in between — depends upon a variety of things, including situational factors and your own discretion. I often work with dog owners who think they need to limit their dog to a heel position because that’s the only way for well-behaved dogs to walk. This rigid adherence to the heel can cause its own problems, though. Preventing a dog from exploring may increase his desire to do so and can cause him to be distractible and unfocused on walks. In other words, asking your dog to heel for the entire walk can actually make it harder for him to heel at all. It’s important for your dog to have the ability to investigate interesting scents and sights in his environment, and a walk offers a controlled situation in which to do this. Dogs who are always made to walk directly at their owner’s side may miss out on this important engagement. I like to alternate between asking a dog to walk next to me in a heel position and allowing him to walk out on a loose leash. There are cases, however, where your dog will need to remain immediately next to you. 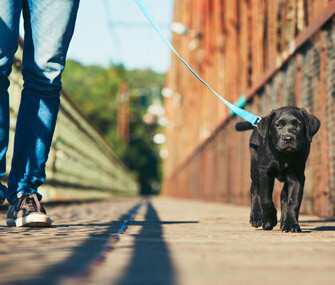 If your dog needs extra management and supervision during walks, he will do best walking directly next to you at all times. In this case, the dog should be given time to explore and be a dog either before or after the walk. This may mean allowing him to to venture out on a longline or within a securely fenced space. Your dog may also choose to walk close to you. Some dogs will stay in the heel position during a walk out of a personal preference. If your dog wants to be close to you, that’s fine — just be sure you encourage him to stop and smell the roses (or anything else that might be interesting for him to sniff).